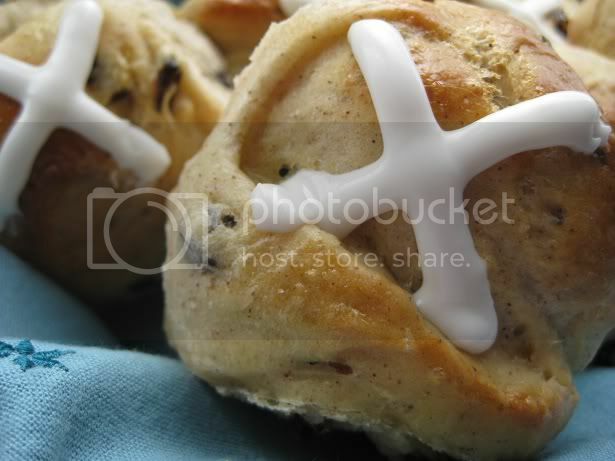 Every time I see Hot Cross Buns at the grocery store this time of year, I almost always buy them out of a sense of seasonal propriety. (In the event you are unfamiliar, these pastries are served on Good Friday. There is much folklore surrounding them – whether they will heal the sick, prevent fires, or help me bake perfect bread year round remains to be seen.) However, despite the tasty appearance of the little pastry with the frosting cross piped on top, they inevitably contain candied fruit peel - and if there is one thing I can do without in life, it is candied fruit peel. And cauliflower. But, I digress. This year instead of buying buns I would end up not liking, I decided to undertake baking my own Hot Cross Buns, so I could include whatever fruits I wanted. I opted to make a traditional currant bun – in the end, all my grocery store carried were Zante Currants, which as it turns out, are just miniature raisins that cost extra. After a world wide web search, I followed this recipe for the actual dough as it seemed fairly straightforward. The hardest part was all the waiting as the smell of baking raisin bread filled the house, but it was worth it in the end! I used a plain vanilla/confectionary sugar frosting from another recipe to pipe on the crosses in the end rather than the orange frosting suggested on the original recipe site. They were particularly tasty with a cup of tea. Lastly, I highly suggest baking them before you take your next sea voyage, as they are supposed to ward off shipwrecks! Instructions: Mix 2 cups of the flour with the sugar, yeast, cinnamon and salt in a large bowl. Heat the milk and butter together to about 120-130 degrees F (this took me about 2 minutes on 50% power in the microwave). Mix the milk/butter into the dry ingredients just until all is moistened. Beat in the eggs until smooth. Add the remaining 2 cups of flour to form a soft dough. Turn the dough out onto a floured surface, and knead about 8 times. Take the dough and place into a bowl coated with non-stick spray. Cover and let rise for 1 hr. Divide the dough into 18 balls and place into 2 round cake pans. Cover again and let rise for an additional 30 minutes. Beat the final egg and water together, and brush onto the buns. Bake for 18-22 minutes or until golden. Cool completely and pipe on a frosting cross onto each bun. You mean we spent an extra dollar for just really small raisins?